Prompted by the success of young men’s clothing sales at Burton, Topman was launched in the late 1970s as a brother to the sister brand Topshop. Now an international concern in its own right, Topman offers a wide variety of fashionable, affordable clothes with many famous-name collaborations under its belt and has won many of fashions most prestigious awards. Back in the UK, you’ll find the stores in all cities and most large high streets. Click here to find your nearest Topman store. Where can I check my Topman Gift Card Balance Online? You can check your Topman Gift Card balance online here- Topman Gift Card Balance Checker. I have a Topman Gift Card – where can I spend it? 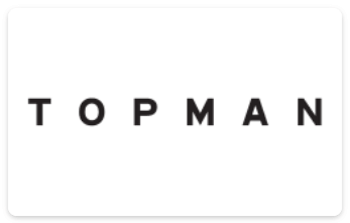 It’s probably no surprise that your Topman card is welcome at all Topman stores in the UK, and also online at their website which also stocks ranges you won’t find in the stores themselves. As part of the Arcadia group, the card can also be used in Topshop, Miss Selfridge, Burton, Evans Clothing, Dorothy Perkins and Outfit stores. Can I buy a Topman Gift Card? You can buy a Topman Gift Card in any Topman store in the UK, with a selection of gift card wallet designs. Click here to see your nearest Topman Store. You can also buy a gift card to be sent by post from the official Topman Gift Card site. Topman also offer e-gift cards sent instantly by email – Click here for details. Anything else I should know about Topman Gift Cards? You need to make sure you spend your card within 2 years of purchasing it, after which time if the card hasn’t been used, it’ll be cancelled and you’ll lose the balance, which nobody thinks is cool.